by Shannon Clark in Save Your Sanity | 5 comments | Contains affiliate links. The night I had to go lay down in the middle of dinner for the second time that week, I knew I needed a new plan to fight fatigue naturally. What follows is the 7 step action plan that has helped me to fight fatigue naturally, even when too exhausted to follow strict protocols or make drastic diet changes. I had tried so hard for over a year, looking for that dramatic cure that would suddenly have me bounding with energy. The strict diets and detailed supplement regimens I had tried didn’t help, in part, because they were way too involved for me to maintain. I’m a mom with two tiny ones who depend on me. I need something really easy to fight fatigue that works! I’m exhausted, hello! There’s no way I have the energy for a complete lifestyle overhaul, especially not to maintain it on a consistent basis. My outlook on my health (and many other things) has totally transformed this year to be one of less perfectionism and more efficiency. 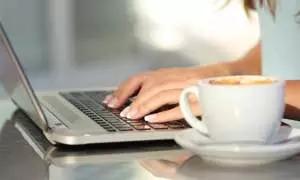 Now I’m working on making small changes that will make a significant impact in helping me manage my fatigue and give me a better quality of life on a daily basis. To come up with my new strategy for fighting fatigue naturally, I looked to Nourished Metabolism: The Balanced Guide to How Diet, Exercise and Stress Impact Your Metabolic Health. 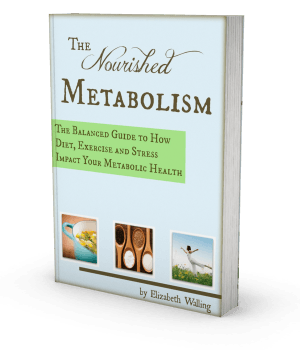 It’s by Elizabeth Walling of The Nourished Life. I love the way she’s distilled a massive amount of research into really practical tips and an interesting-to-read format. She struggled with fatigue herself, and through her research and experience came out on the other side. I’m so thankful to her for sharing what she discovered! These are the strategies I’ve been working to implement to fight fatigue naturally. Ya, seriously. Eat. Not a special diet. Just eat. When the kids are pulling on me and needing so much, I still have to make it a priority to feed myself. Food is fuel. There’s no way I’m going to be able to overcome fatigue without the energy it provides. I’ve ignored the hunger signals my body was sending me for so long, sometimes I feel like I’ve forgotten how to listen to my body! I really appreciate the simple breakdown of calories, carbs, and protein in Nourished Metabolism to use as a guide until I can get back on track. I had food allergy testing done earlier this year, and found that (as my doctor instructed) I should never take another bite of gluten again. Well, in my exhausted state that message didn’t get through my head. At that time I was just so done with restrictive diets that didn’t work. I was struggling just to make sure I ate at all. I just couldn’t handle the effort of another big change. Finally months later I came across my lab results and it clicked. I decided to keep it simple and just cut out my top 3 food allergies: wheat (gluten), peanut, and coconut. I’ll worry about the rest of the list later. Almost immediately some lifelong issues that had been really debilitating were alleviated, and I was super motivated to stick to my commitment to avoiding my food allergens. Another obvious one that is easier said than done: get enough sleep. Unfortunately, even when completely exhausted sleep can be illusive. For me, this step means teaching my toddler to sleep. It’s taken me a while to accept that I can’t always be the one to get up in the night to comfort her, and even more so to ask my husband for help with nighttime parenting. Despite my resistance, it has been worth it. Our daughter looks forward to having Daddy rock her back to sleep, and I am benefiting from the extra sleep. After being in the routine of getting up and down so many times in the night for so long, it was really hard for me to get back to sleep. I’d be up for hours, miserably thinking about how little time I had left to sleep that night. for our bedroom. It didn’t stop the baby from waking, but I started falling asleep much faster right away! I know if you’re exhausted, you hate to see exercise on the list! It’s probably the very last thing you want to do when you’re so tired. Sometimes it just seems impossible. Exercise can be helpful to fight fatigue, however, so finding a way to do a small amount of exercise is worth the effort. It seems every winter my fatigue is so much worse. It’s a downward spiral that starts in October and continues downward through March, taking me all summer to recover. I looked into light therapy boxes but ultimately ruled that out because of the cost. When I read that dawn simulators can be just effective, and much more affordable, I decided to try it. I bought this $20 model that plugs right into your bedside lamp. It automatically starts turning on the light at the time you set, slowly getting brighter for the half an hour before you want to wake up. Even if it’s dark outside, it tells your body it’s morning. It really makes a difference in how I feel in the morning and how quickly I’m able to get going. I wish I would have sprung for the $40 model that can be programmed with different waking times for different days of the week! Ours usually gets turned off on the weekends! Nourished Metabolism helped me to understand that it isn’t just sleep that affects how tired we feel. Even small hidden stresses can contribute to fatigue. Elizabeth points out that we often can’t control some of the bigger stresses in our lives. However, we can manage the smaller stresses to help us feel more energized. You probably already know this if you’ve ever been dreading a task like scheduling a dentist appointment, or maybe it’s a routine that just isn’t working within your family life day after day. It really isn’t a big thing, but each time you think about it, it drags you down. Many of these little stresses can add up and really tax your energy and metabolism as a result. I also make sure to identify those nagging little tasks and troubles that are weighing on me and get them taken care of as soon as possible. I even go so far as to avoid books and movies with violence and drama that will stress my sensitive psyche. This all has been a big help! On the days when I manage to follow most of these strategies, I have a good day with consistent energy. When I don’t, I’m often toast by 10 am. These are the steps that I’m using to fight fatigue naturally, but there were tons of simple but amazing tips in the book that might be of help to boost your energy. Probably the most helpful part of the book was Elizabeth’s teaching on how to listen to your body’s biofeedback to know exactly what strategies are working for your body, rather than following an arbitrary plan made for someone else. Nourished Metabolism is now available on Amazon in Paperback and for Kindle! If you’re struggling with fatigue, I also recommend reading Farewell, Fatigue: How I Overcame Chronic Fatigue the Natural Way. 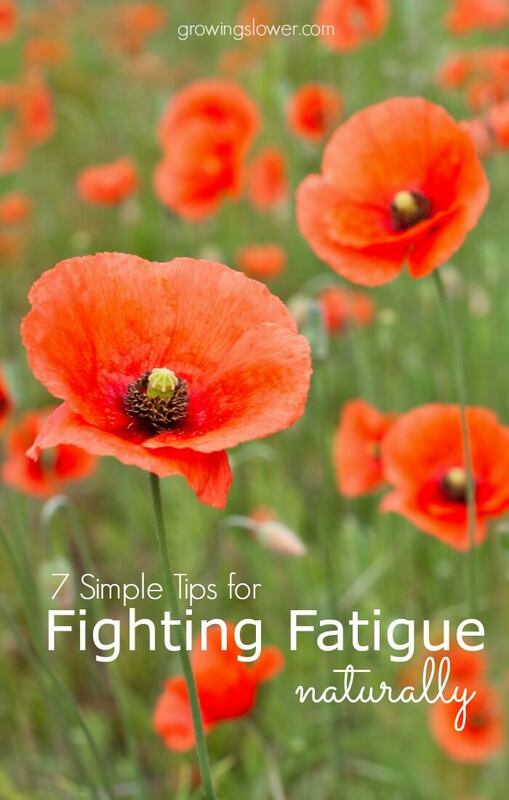 It offers dozens of simple, manageable tips to fight fatigue naturally. What simple strategies have helped you fight your fatigue? How do you stick to them even when you’re really exhausted? #6 is tough for me, but I have found the rest to be very helpful. Along with eating well is remembering to stay hydrated with lots of water. I am continually amazed at how much energy I get from regular exercise. 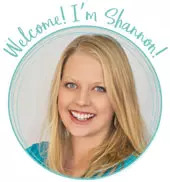 Thanks for sharing these tips, Shannon. Most of us know this, but we often need the reminder to get us back on track. Love these tips! The stress bit is huge for me – it’s amazing how draining stress can be. I used to think I was too tired to exercise…and seriously, I was. But, once I started making even 15 minutes a day a priority, I found I slept better and had a LOT more energy! Such excellent points! I can get busy and forget to eat. In fact, every time I have a bio scan done, my results say I’m trying to lose weight. lol That’s not really the case. Vit D is a huge help to me as well! I appreciated your article. I live with chronic fatigue, You do not think right when you are exhausted. I loved the simple steps.